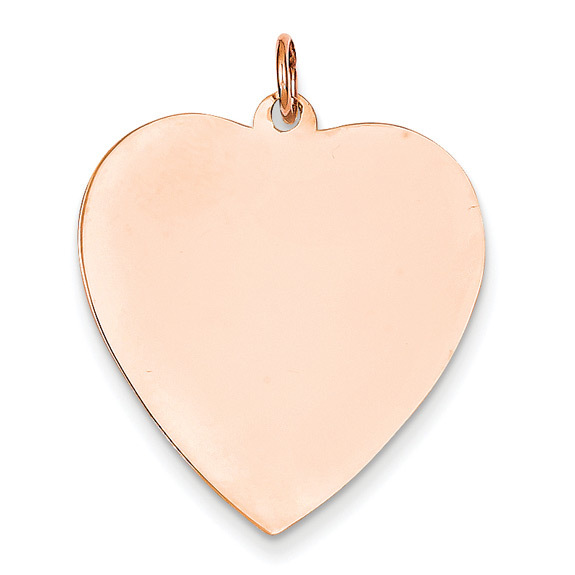 A fully solid 14k rose gold engravable heart charm pendant, which can be engraved on both sides, with up to 3 lines per side (8 characters max. per line, including spaces). The rose gold heart pendant measures just under 1 5/16" tall (with hoop/bale) x approx. 1" wide. Ships within 1 business day. With optional engraving, please add 3-4 business days. We guarantee our 14K Rose Gold Engravable Heart Charm Pendant to be high quality, authentic jewelry, as described above.